Serge & Anne Golon is not one person: it's the pen name of two authors, Serge and Anne Golon, husband and wife. Serge did the historical reasearch of the Angelique series, while Anne took care of the romance itself, creating all the fantasy part. This page should not be combined with either's individual author page. CK information for each should be entered on their individual pages, not their joint page. Author Anne Golon, best known to English-speaking readers as Sergeanne Golon, was born Simone Changeux. She married Vsevolod Sergeïvich Goloubinoff, better known as Serge Golon. Together they published the Angélique novels beginning in 1956. 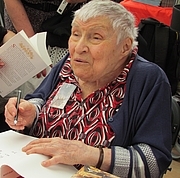 After Serge's death, Anne continued writing the series. Sergeanne Golon is currently considered a "single author." If one or more works are by a distinct, homonymous authors, go ahead and split the author. Sergeanne Golon is composed of 27 names. You can examine and separate out names.